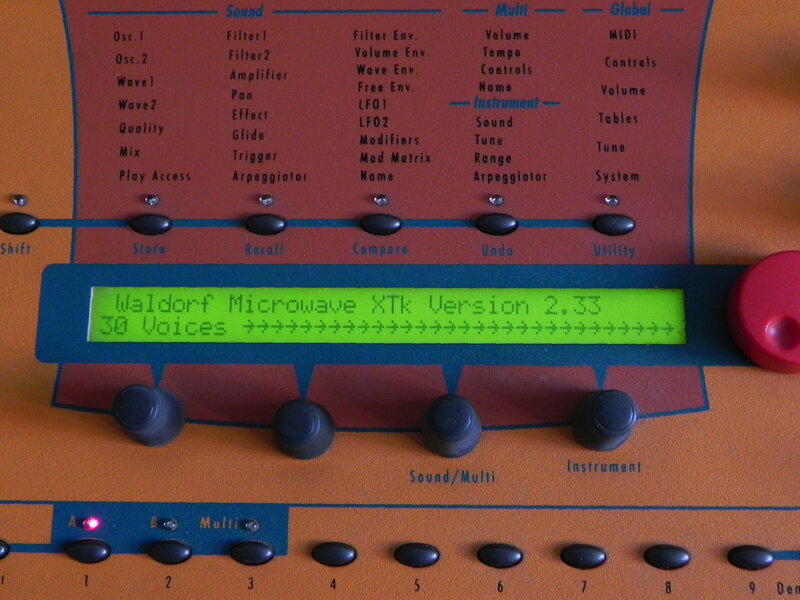 In 1997 Waldorf Electronics released a DSP based version of the Waldorf microWave called microWave II. A year later they introduced the microWave II/XT: a bigger and orange version of the MW II with additional knobs and a built in delay FX. And in 1999 the keyboard version of this extended MW II/XT was released. A Fatar keybed with 4 octave of keys with velocity and aftertouch control and a nice panel with 43 encoders and a volume pot to be used. two thumb wheels for pitchbend and modulation on the left of the keyboard. Wooeden ends an a bright orange metal housing. Inside you find more or less all original microWave wavetable features plus additional features like two filters, some special filter modes like FM and sine-shapers and a built in chorus and delay. A wide modulation matrix offereing all the virtual patch chords to get nice abstract FX or sound noodles. The XTk is a 10 voice synth like the MW II. With a special DSP board you got 20 additional voices to get a 30 voice version of the rack version MW II/XT or the MW II/XTk. You can use a multimode for multitimbral keysplits or or layers. And 30 voices will give you much fun without causing voice stealing when changing from one to another chord of layered pad sounds. The MW II in the original, XT and XTk versions got a different, less harsh character as the original microWave. You can get real complex digital sounds, but also nice pads. The obvious built in analog bass emphasing on the output is adding a nice character. I really like the lush pads you can do with it as much as nice FX or atmospheric sound textures. But a typical snappy original microWave bass is not available.